KISS released "The Casablanca Singles 1974-1982" box set this week in North America (it will be available around the world in January). In their early years, KISS released a total of 29 singles on seven-inch 45 RPM records for the Casablanca label. These were available for sale to the public, used for commercial radio airplay and to promote album sales. Many of these singles had entirely different mixes, edits and material that didn't appear on their vinyl albums. 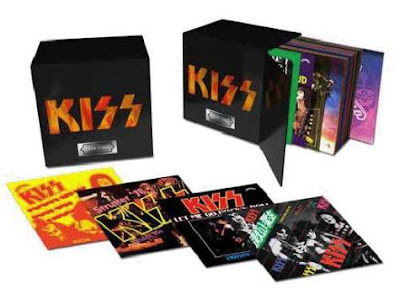 The sets are housed in a die cut shadow box with a limited edition etched silver metal plate and ribbon pull magnetic closure custom KISS 45s box with 26 collectible picture sleeves from original single releases around the world, including Japan, Germany, Holland, Spain and Britain. The vinyl collection also features singles from all four solo albums in purple, blue, red and green vinyl with a mask picture sleeve representing each individual member as originally released in the U.K. Both sets include a booklet which tracks the genesis and chart history of each single represented in the package. "The Casablanca Singles 1974-1982" covers KISS' eight-year stay on Bogart's label, from their very first, "Nothin' to Lose" b/w "Love Theme from KISS", from their self-titled debut to their very first charted 45, "Kissin' Time". The band's subsequent string of hits included "Dressed to Kill"'s live version of "Rock and Roll All Nite" (#12 on Billboard's Hot 100), "Destroyer"'s "Shout It Out Loud" (#31) and the Top 10 ballad "Beth", "Rock And Roll Over"'s "Hard Luck Woman" (#15) and "Calling Dr. Love" (#16), "Love Gun"'s "Christeen Sixteen" (#25), Ace Frehley's solo hit, "New York Groove" (#13) and "Dynasty"'s "I Was Made for Lovin' You" (#11). "This collection is meant for the true KISS aficionado,” adds Paul Stanley. “The packaging really captures the development of both our music and image at a very crucial period in the band's history." KISS have issued a two-minute promotional video for the new package.